We’ve had a great week including a super cool photo shoot featuring some of our latest items. We’ll be showcasing varying styles this Spring. We worked with an amazing photographer, Jaki, of Studio Jaki. She does great work and we appreciate her spending the day with us, making our models look fantastic. We’re also headed to TribalCon next week which is a huge Tribal Bellydance conference that features a variety of dance styles and musicians. It is hosted by Ziah of Awalim Dance Company. She and her team have a long history in the arts in Atlanta and TribalCon is a big hit nationwide with many flying in from both coasts to attend. In the studio, our resident archivist spent the entire Thursday evening celebrating Lunar New Year. We’re big fans of it and are sharing some great savings with you. All purchases of $100 or more get 10% off with our code “Lunar.” That includes our Water Sleeves that were inspired by the holiday and our friends in Water Sleeve Dancing class. 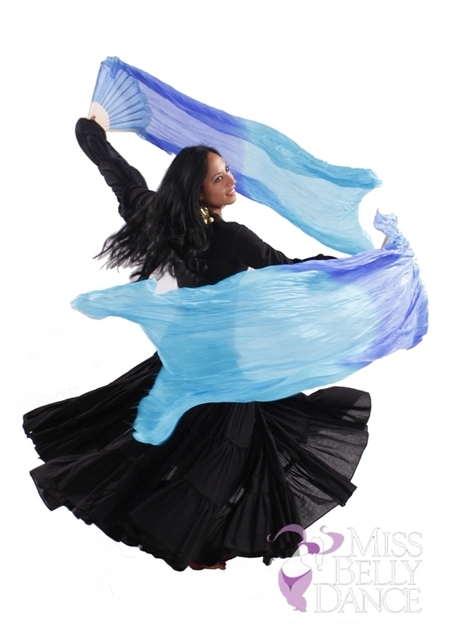 “We used to have to make our own, so I asked MissBellydance.com if they could make some for us.” -Resident Archivist and Water Sleeve Dance Fan. We’ve been selling these now for about 3 years. Let us know how they work in class or if you use them for other types of dance. You can see the sleeves, how they fit and are worn. We hope to show you a full ensemble after the April show. We’re still going strong with one week left in our participation in the Wear Red for Women campaign to help the American Heart Association. We’ll be giving away a $50 gift certificate to one of the wonderful customers who participated in the month long recognition of Heart Health Awareness. Remember, you can still participate by placing the word “heart” in the comments box when you are ready to check out. 5% of that order goes to help the American Heart Association. So, in short, we’re busy being a part of the great dance community in Atlanta and branching out to serve others. Hope you’ll join us all year long in our quest to share our amazing culture and help raise awareness for various causes! Thanks to all who participated! Come by and see us at TribalCon next week! We’ll have more on that in a few days! Live Tweets and prizes too! TribalCon is this week! We’re Excited!